Such high figures may suggest hefty cost-savings on the horizon; however, remaining barriers need to be addressed before the full potential of this market can be achieved. New-to-market generics increase access to medications through cost-savings, and biosimilars may be no different. Patients, providers, and payers need more treatment options, and pharmacists play a key role in managing the educational barriers between these key stakeholders. 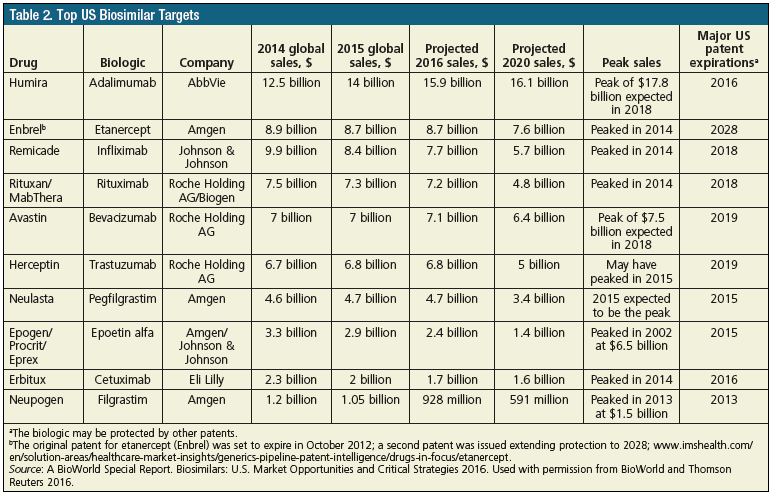 It is crucial to understand the market these biosimilars are about to enter. Although innovation is essential to enhancing patient care, biosimilars can surely fill a need by expanding patient access to medications, as well as by potentially driving even more innovation through increased competition. With appropriate guidelines and proper education, these agents are primed to cause significant market disruption; however, barriers within the current approval pathway will continue to constrain their use, if these barriers are not addressed. Like biologic drugs, biosimilars are complex proteins developed from living organisms. However, biosimilars cannot be identical to their reference drugs, which is the reason a separate pathway to approval was required. In addition, biosimilar manufacturers must have their facilities approved and must present head-to-head comparisons of their drug against the reference drug to receive FDA approval.1,10 Although biosimilars are not identical to their reference drug, they are extremely similar, and each indication for which they are seeking approval must be validated through clinical trials, as required by the FDA. This is key to understanding why biosimilars are currently not considered interchangeable with their reference drugs, and will present frequent educational opportunities for pharmacists. Within the 351(k) pathway, an interchangeable biologic is a biosimilar that is expected to achieve the same clinical result as the reference drug when substituted.12 According to the FDA, “To be determined to be an interchangeable biological product, it must be shown that for a biological product that is administered more than once to an individual the risk in terms of safety or diminished efficacy of alternating or switching between use of the biological product and the reference product is not greater than the risk of using the reference product without such alternation or switch.”12 The issue is that although the FDA must determine interchangeability, the FDA has yet to establish guidelines for interchangeability within the biosimilar pathway.2 In other words, manufacturers cannot submit clinical trial data for interchangeability because the FDA has yet to release such guidelines. For example, the FDA’s Purple Book of biologics lists a designation of biosimilar for infliximab-dyyb and filgrastim-sndz, but this does not include interchangeable (Table 1).13 This means that neither of these drugs can automatically be substituted for their reference drug at the pharmacy level. This is key to understanding why the immediate impact of a biosimilar is different from that of a generic drug. Although eager to expand the treatment options, payers may be hesitant to add the approved biosimilars to their formularies without appropriate data, and providers may see them as a completely different medication. To be designated as interchangeable would be a significant win for any drug when penetrating a market. By contrast, the EMA does not address interchangeability in its guidelines, leading to varying acceptance decisions among different European countries with regard to biosimilars.2 As a result, this has potentially limited the overall impact of biosimilars across Europe, because of inconsistency among countries and a lack of understanding among prescribers. For example, in Ireland, it is acceptable to make a patient switch to a biosimilar, although multiple substitutions are not allowed, whereas in Denmark all biosimilars are said to be interchangeable unless proved otherwise.8 Although foreign markets have varied greatly in acceptance, a competitive US market paints a picture of opportunity for expanded access to biosimilars. Still, the 15% discount rate differs greatly from the 80% to 90% discount realized when generics are brought to market; but a 15% discount on a biologic could offer substantially more savings than an 80% discount on a nonspecialty medication, simply because of the average prescription costs. A great example of cost-containment and enhanced access is that of filgrastim in the United Kingdom, which was recently highlighted in a publication from the IMS Institute for Healthcare Informatics.8 After the launch of the first filgrastim biosimilar in 2008, multiple Strategic Health Authorities in England updated their treatment guidelines to include data comparing the cost-effectiveness of filgrastim and its biosimilar; the biosimilar was then added as a first-line therapy in cancer treatment.8 As a result, the use of the originator and the biosimilar increased by 104%. Recently, CVS Health announced that it will be removing an insulin glargine injection (Lantus) from its 2017 formulary and replacing it with a different insulin glargine injection (Basaglar).18 This action by CVS Health serves as a preface to how biosimilars are primed to affect the market; although Basaglar is not designated as a biosimilar in the United States as it is in Europe, the drug is set to test the waters of the biosimilar market.19 Lantus is by far one of the most, if not the most significant agent to be removed from payers’ formularies, and it should be expected that drugs of similar market value will continue to be targeted by manufacturers for biosimilar development, and by payers to replace agents on their list of formularies. Other markets, including that of Europe, have established a much greater foundation for biosimilars than the United States. However, overall acceptance of biosimilars has been burdened, and can vary extremely by country for a variety of reasons, including inconsistent rules of interchangeability and a lack of provider education. Although it is too early to predict exactly how biosimilars will affect the US market, there will be no shortage of opportunity for these agents to disrupt the current landscape and offer more cost-effective alternatives to high-cost biologics, as seen in Table 2. The data in Table 2 represent sales generated by 10 different biologics, including 4 of the top-grossing medications globally (ie, adalimumab, etanercept, rituximab, and infliximab). Together, these 4 medications accounted for approximately $40 billion in global sales in 2015, and each has multiple biosimilars in the US pipeline, in addition to infliximab’s biosimilar infliximab-dyyb, which has already received FDA approval. An area where multiple stakeholders intersect is the pathway to interchangeability. As noted, the FDA has yet to release guidelines for interchangeability, creating a frustrated environment for manufacturers. However, a few biosimilar sponsors have begun studies where patients begin therapy with an originator drug, and are then switched to a biosimilar agent.2 Interchangeability is crucial for payers to gain confidence that their patients will be appropriately managed, for providers to have confidence in what they prescribe, and for manufacturers to continue to invest in the biosimilars market. Within the world of high-cost biologics, providers need more treatment options, and payers need to expand access to treatment, both of which can be achieved through development of updated guidelines that are focused on the most cost-effective treatment regimens. In turn, this will provide manufacturers with confidence that appropriate pathways exist, allowing for market penetration of their drugs. With appropriate pathways, updated treatment guidelines, and a focus on stakeholder education, biosimilars will be given the right tools in a market full of opportunity. US Food and Drug Administration. FDA approves first biosimilar product Zarxio. March 6, 2015. www.fda.gov/newsevents/newsroom/pressannouncements/ucm436648.htm. Accessed July 7, 2016. BioWorld. Biosimilars: U.S. market opportunities and critical strategies 2016. 2016. http://images.info.science.thomsonreuters.biz/Web/ThomsonReutersScience/%7Bacfdc5b8-c04e-46ec-b1ea-a34db8bc411a%7D_biosimilars_premium.pdf. Accessed August 10, 2016. US Food and Drug Administration. FDA approves Inflectra, a biosimilar to Remicade. April 5, 2016. www.fda.gov/NewsEvents/Newsroom/PressAnnouncements/ucm494227.htm. Accessed August 11, 2016. Brown T. Biosimilar to Humira recommended by FDA panel. July 13, 2016. www.medscape.com/viewarticle/866058. Accessed August 11, 2016. Sandoz biosimilar etanercept recommended by FDA advisory committee for approval to treat multiple inflammatory diseases [news release]. Holzkirchen, Germany: Sandoz Inc; July 13, 2016. www.sandoz.com/media_center/press_releases_news/global_news/2016-07-13-sandoz-biosimilar-etanercept-recommended-by-fda-advisory-committee-for-approval.shtml. Accessed August 11, 2016. IMS Health HQ Limited. Top 20 global products 2015. December 2015. www.imshealth.com/files/web/Corporate/News/Top-Line%20Market%20Data/Top_20_Global_Products_2015.pdf. Accessed August 11, 2016. IMS Institute for Healthcare Informatics. Medicines use and spending in the US: a review of 2015 and outlook to 2020. April 2016. https://morningconsult.com/wp-content/uploads/2016/04/IMS-Institute-US-Drug-Spending-2015.pdf. Accessed August 9, 2016. Aiken M. IMS Institute for Healthcare Informatics. Delivering on the potential of biosimilar medicines: the role of functioning competitive markets. March 2016. www.imshealth.com/files/web/IMSH%20Institute/Healthcare%20Briefs/Documents/IMS_Institute_Biosimilar_Brief_March_2016.pdf. Accessed August 11, 2016. Humer C. Exclusive: makers took big price increases on widely used U.S. drugs. April 5, 2016. www.reuters.com/article/us-usa-healthcare-drugpricing-idUSKCN0X10TH. Accessed September 14, 2016. Amgen Inc. 2016 trends in biosimilars report: our next chapter in healthcare. April 2016. www.amgenbiosimilars.com/~/media/amgen/full/www-amgenbiosimilars-com/downloads/2016_trends_in_biosimilars_report.ashx?la=en. Accessed August 11, 2016. Generics and Biosimilars Initiative (GaBI). Biosimilars approved in Europe. May 6, 2016. www.gabionline.net/Biosimilars/General/Biosimilars-approved-in-Europe. Accessed August 11, 2016. US Food and Drug Administration. Background information: lists of licensed biological products with reference product exclusivity and biosimilarity or interchangeability evaluations (Purple Book). March 5, 2015. www.fda.gov/Drugs/DevelopmentApprovalProcess/HowDrugsareDevelopedandApproved/ApprovalApplications/TherapeuticBiologicApplications/Biosimilars/ucm411424.htm. Accessed March 6, 2016. US Food and Drug Administration; Center for Drug Evaluation and Research. 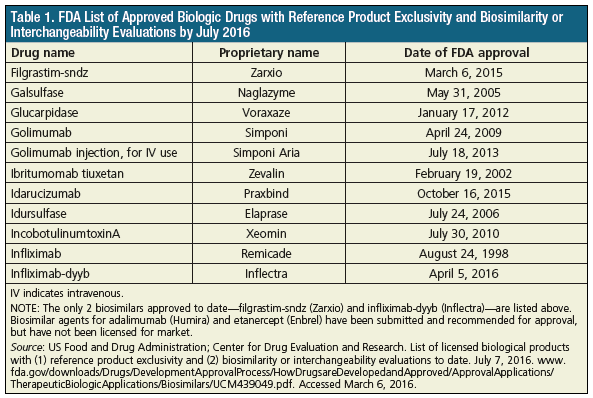 List of licensed biological products with (1) reference product exclusivity and (2) biosimilarity or interchangeability evaluations to date. July 7, 2016. www.fda.gov/downloads/Drugs/DevelopmentApprovalProcess/HowDrugsareDevelopedandApproved/ApprovalApplications/TherapeuticBiologicApplications/Biosimilars/UCM439049.pdf. Accessed March 6, 2016. Express Scripts. Express Scripts 2015 drug trend report executive summary. March 2016. http://lab.express-scripts.com/lab/~/media/e6bfbe7c0ed34c6aa20ff451a6e18d0d.ashx. Accessed August 11, 2016. Express Scripts. Express Scripts 2015 drug trend report. March 2016. http://lab.express-scripts.com/lab/~/media/e2c9d19240e94fcf893b706e13068750.ashx. Accessed September 14, 2016. Avalere Health. Patient out-of-pocket costs for biosimilars in Medicare Part D. April 2016. http://go.avalere.com/acton/attachment/12909/f-02c0/1/-/-/-/-/20160412_Patient%20OOP%20for%20Biosimilars%20in%20Part%20D.pdf. Accessed August 11, 2016. Stanton D. Zarxio one year on: US biosimilars market still riddled with uncertainty, expert. March 9, 2016. www.biopharma-reporter.com/Markets-Regulations/Zarxio-one-year-on-Questions-remain-around-US-biosimilar-market. Accessed August 11, 2016. CVS Health. 2017 standard formulary list of removals and updates. August 1, 2016. http://investors.cvshealth.com/~/media/Files/C/CVS-IR-v3/documents/02-aug-2016/2017-standard-formulary-list-of-removals-and-updates.pdf. Accessed August 19, 2016. US Food and Drug Administration. FDA approves Basaglar, the first “follow-on” insulin glargine product to treat diabetes. December 16, 2015. www.fda.gov/NewsEvents/Newsroom/PressAnnouncements/ucm477734.htm. Accessed September 14, 2016.